Aloha from Maple Grove, Minnesota. This place is great. We drove through Wisconsin to get here. This whole region seems to be Alex's home away from home. The other relief about being here is that we finally made it to church. Yesterday was our 7th Sunday together since we got out on the road in October. And on each Sunday, while we are hustling from one event to the next, Alex reminds us that we should be in church. To be honest it's not a regular part of my weekly routine at home either. That is also something Alex has set out to work on. Since the beginning of the trip he's been telling people, "Loren is Roman Catholic, but he's wandered a bit and we're going to straighten him out." Not sure if this trip has straightened me out or made me more bent and crooked than ever. But Alex's spiritual concern is welcome. His faith is definitely a defining characteristic of who he is and it supports much of his success as a celebrity. 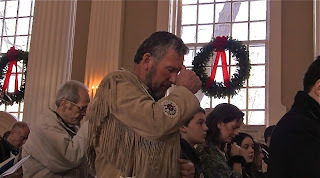 Several times a day Alex connects with a fan who says thanks for Alex's regular, public displays of his faith on television. If fans are created by their finding something about a celebrity to relate to or connect with, Alex has made a lot of fans by being prayerful and admitting he's flawed and that he needs to forgive and be forgiven. One of the frequent comments from Alex's faith based fans is that they just don't see religion practiced in popular television very often. I can see where they're coming from. 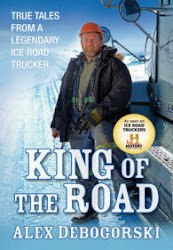 It's an interesting decision made by the History Channel, which airs Ice Road Truckers, to include Alex's faith as part of his character. Whenever people express their gratitude for that to Alex, he also encourages them to thank History Channel. I'm not sure if it's a religious axiom, but I've always been told "what goes around, comes around." That is definitely the case with Alex's religious practice. The fans that are grateful to him often bear gifts: they pray for Alex, they share prayer books and ultimately, they share a very personal part of their life. From where I sit it makes the fan-celebrity relationship much different. It is not superficial or hysterical. It is personal and heartfelt. So yesterday we made it to Our Lady of Perpetual Help, on the outskirts of Chicago. Thanks to Father Hickey and the congregation for taking us in. Next Sunday we'll miss church again. We'll be flying home to Yellowknife. Roads are getting icy, drive safe.